Join us in welcoming Patricia Sone as she travels from Texas to New England for her first workshop in our area! 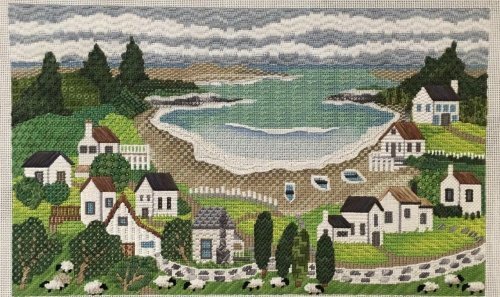 She will be here in September to teach Melissa Shirley's design called "White House Cove", a picturesque landscape with ocean views! Stitch this appealing piece while working with great threads and embellishments and learning new techniques and stitches. Pick a canvas and Patricia will work with you to choose stitches, threads, ribbons, and embellishments to make your own unique work of art! Space is limited to 6 students so that everyone gets ample time to work with Patricia. I am a native of Dallas, Texas, and have been stitching since my early teen years. 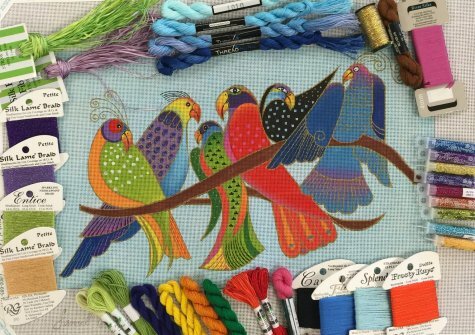 I am passionate about learning and developing new stitches and techniques for needlepoint, and I love sharing my ideas with others. I was employed by Creative Stitches and gifts in Dallas, Texas for 5 years before resigning in early 2014 to pursue independent work. I am a member of TNNA, EGA and ANG, and have a B.A. in English from Southern Methodist University. 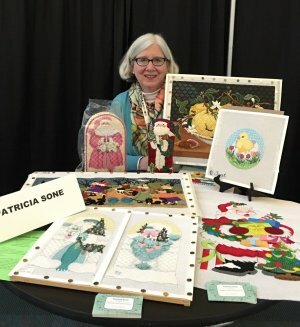 I taught at Destination Dallas in 2015, and love travelling and teaching Embellishment and Project classes at needlepoint shops across the country. I also enjoy working with designers and shops to develop special projects. I look forward to teaching the Studio Time Class at Bluebonnet 2017.